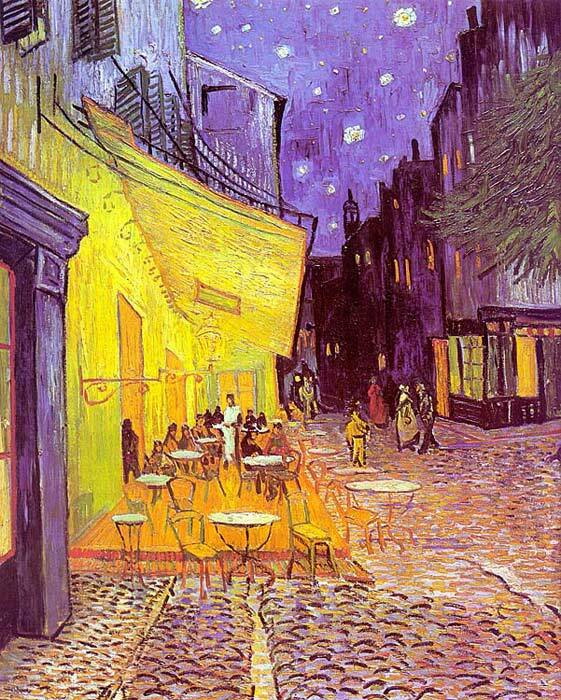 Cafe Terrace at Night, also known as The Cafe Terrace on the Place du Forum, is a painting by the Dutch artist Vincent van Gogh which he rendered in Arles, France in September 1888. Van Gogh used oil paint on canvas and the painting is 81 × 65.5 cm (32" × 26"). The painting is currently at the Kröller-Müller Museum in Otterlo, Netherlands. I was only interrupted by my work on a new painting representing the exterior of a night café . On the terrace there are small figures of people drinking. An immense yellow lantern illuminates the terrace, the facade, the side walk and even casts light on the paving stones of the road which take a pinkish violet tone. The gables of the houses, like a fading road below a blue sky studded with stars, are dark blue or violet with a green tree. Here you have a night painting without black, with nothing but beautiful blue and violet and green and in this surrounding the illuminated area colours itself sulfur pale yellow and citron green. It amuses me enormously to paint the night right on the spot. Normally, one draws and paints the painting during the daytime after the sketch. But I like to paint the thing immediately. It is true that in the darkness I can take a blue for a green, a blue lilac for a pink lilac, since it is hard to distinguish the quality of the tone. But it is the only way to get away from our conventional night with poor pale whitish light, while even a simple candle already provides us with the richest of yellows and oranges. This is the first painting in which Van Gogh used starry backgrounds.Van Gogh went on to paint star filled skies in Starry Night Over the Rhone, painted the same month, and the better known Starry Night a year later. Also, in Portrait of Eugene Boch Van Gogh painted a starlight background. SPECIAL NOTE : The painter will make the reproduction as close to the original oil painting as possible. If you want your painting to alter from this likeness, please email us and " Cafe Terrace at Night, 1888 " will be reproduced according to your special requirements.